Grits are a staple of southern cooking, but they're slowly gaining popularity across the country. They are a porridge made from ground corn, and you can enjoy them sweet or savory. Once you master the basic recipe, you're ready to experiment with additional flavorings. Forget the instant packaged grits. This is the traditional way to cook grits and serve them up piping hot. 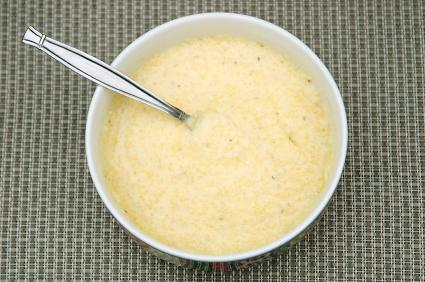 The basic ratio of grits to liquid is 1:5, but you can reduce the liquid by 1/2 cup if you prefer thicker grits. One cup of cooked grits serves approximately four people, so you can cut the recipe in half to make just two servings, or double it to make about eight servings. In a heavy saucepan, bring the water to a boil, and then reduce the heat to a simmer. Slowly stir in the grits and salt, and continue stirring until they thicken. Turn the heat down to low and continue cooking and stirring for another 40 to 45 minutes until the grits are tender. Stirring will keep them from sticking to the bottom of the pan and burning. When the grits are tender, stir in the butter, and serve. Cooking grits in a slow cooker frees you from the constant stirring required when you cook them on the stove top, and this method also requires a little less water. In a slow cooker, combine the grits and water, and stir. Cover and cook on high for about three hours or until the grits are tender and creamy. Stir approximately every 30 minutes. Stir in the butter, salt, and any other flavorings you like. Fried grits are made from cooked grits. The process is relatively simple, but the results are delicious. Fried grits make an especially nice addition to a country breakfast menu that includes sausage or bacon, eggs, and buttermilk biscuits. Cook a fresh batch of grits according to the basic recipe above, and then let them cool until they are warm, but not hot. Beat one egg, and stir it into the warm grits. Butter a bread pan, and spoon the grits into it, pressing them lightly to create what will become a solid loaf. Cover the pan with plastic wrap, and refrigerate until the grits are firm. Slice the chilled grits, and fry them in butter until they are light golden brown on one side. Flip the slices and fry on the other side until they're golden brown. Serve plain, or top with your favorite topping such as honey, maple syrup, or gravy. 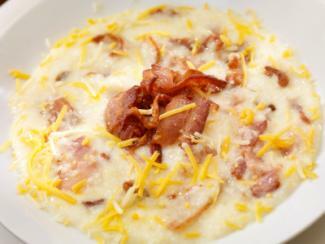 Grits are so versatile you can serve them for breakfast, brunch, lunch or dinner. Depending on what you flavor them with, they can be the star of your menu or a unique side dish. Give them a try, and see how easy it is to bring this country cooking favorite into your own kitchen.